With this iPad transfer for Mac software, you can create, edit and delete iPad playlists. 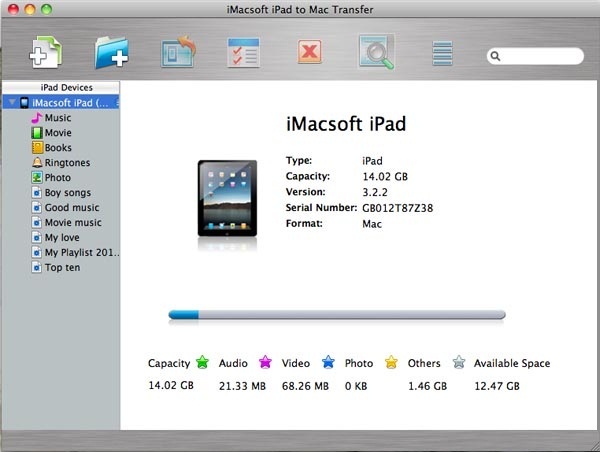 What's more, iMacsoft iPad to Mac Transfer even enables you to open iPad with Finder and use it as a portable hard disk. Also you will find that quick search and filter tools help you hit what you want as easily as iTunes does. iMacsoft iPad to Mac Transfer can keep well compatible with all types of iPad/iPod/iPhone, such as iPad, iPad 2, the new iPad, iPad mini, iPad 4, iPod classic, iPod shuffle, iPod shuffle 6G, iPod nano, iPod nano 5G, iPod nano 6G, iPod touch, iPod touch 4, iPhone 3, iPhone 4, iPhone 5, iPhone 5S/5C, iPhone 6/6 Plus, even the updated iOS 8. Your iPad, your way. The iPad to Mac Transfer provides an ideal solution for you to manage, rip, copy, backup iPad, iPod and iPhone on Mac. Free download it and share iPad files with your friends! How to transfer songs purchased on iPad to Mac local? How to export downloaded podcasts/iTunes U on iPad to Mac computer? How to sync the purchased files on iPad to iTunes library? How to sync the downloaded books/podcast/iTunes U on iPad library to iTunes on Mac? How to transfer iMessage from iPad to Mac computer? How to copy photos to iPad library on Mac? How to transfer ePub/PDF books to iPad on Mac? How to mount iPad as drive on Mac?